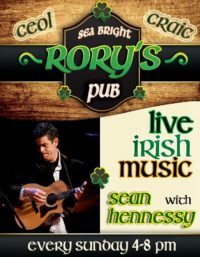 Live Irish Music – Every Sunday from 4PM to 8PM(ish) at the Jersey Shore’s newest (and best) Irish Pub, Rory’s in beautiful Sea Bright, NJ Just a good stone’s throw from the beach. Great food, wonderful staff and a beautiful outdoor patio where we play on the sunny days and a fantastic indoor bar for the rainy days! Guest musicians all the time and an open mic policy if you have a party piece you’d like to share!